This is the first post for our new monthly feature on “Staff Perspectives.” Every month we will be introducing you to a member of the staff here at the FDR Library and giving a look into who we are and what we do. I first began working for the Franklin D. Roosevelt Presidential Library during the summer of 2004 when I spent ten weeks working as a public programs intern. After graduating from St. John Fisher College with a B.A. in history in 2005, I was hired by the Library as an Archives Technician. I earned an Advanced Certificate in Archives and Records Management from Queens College in 2010, and was promoted to an Archives Specialist that same year. 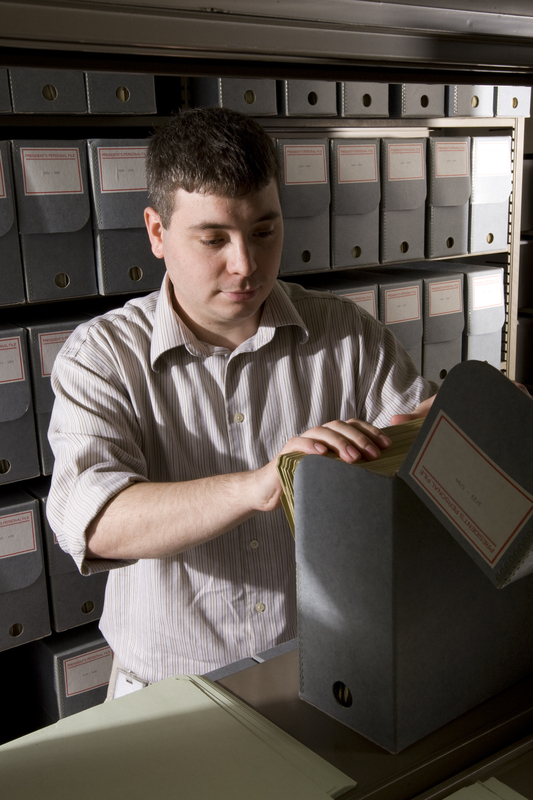 In June 2011 I became a full-fledged Archivist. My responsibilities include answering research queries submitted to the Roosevelt Library by researchers unable to make a personal visit, supervising researchers working in the research room, photograph and audiovisual reproduction orders, and leading a team working to create a database of projects around the country built by the New Deal agencies. The reasons why I love working at the Roosevelt Library are many. First, answering research queries provides me with the opportunity to research a wide variety of topics. In a single day I might get to search through records on Allied aircraft production during World War II, read letters to the Roosevelts from people rescued from destitution by the New Deal relief agencies, and watch film footage of the shenanigans on board a Navy ship during a “crossing the line” ceremony. Another reason that I love working at the Roosevelt Library is that the materials in our collections are evidence of some of the most significant events in the history of the United States, and even the world. The Einstein Letter, for example, led to the creation of the Manhattan Project and the birth of the Atomic Age. The promise of nuclear energy and the threat of nuclear war both exist in the world today because of that letter. Finally, I love working at the Roosevelt Library because of the people here with whom I have the pleasure and privilege to interact on a daily basis. The Library staff is helpful and supportive, and has embraced me as one of their own. The researchers are enthusiastic about their topics, and I learn as much from them as they do from me. Some are devoted admirers of the Roosevelts, others are fierce critics, but all appreciate the impact that Franklin and Eleanor Roosevelt had on the world around them. Eleanor Roosevelt – "My Day"